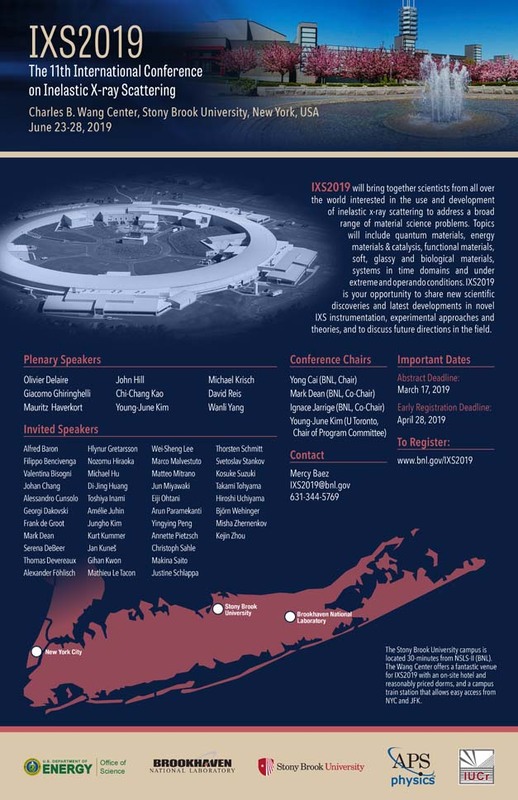 The 11th International Conference on Inelastic X-ray Scattering, IXS2019 will be held in Stony Brook, New York on June 23-28, 2019. It continues a series of meetings held now every two years, most recently hosted by NSRRC in Taiwan (2015) and DESY in Germany (2017). Registered participants are invited to attend the welcome reception, conference dinner, NSLS II facility tour, and excursion. Check-In to be held at Hilton Stony Brook on Sunday, June 23, 2019 from 4 p.m.-7 p.m. The welcome reception to be held at Hilton Stony Brook on Sunday, June 23, 2019 from 5 p.m.–7 p.m.
Thursday, June 27, 2019, 6:00 p.m. Participants and guests (age 16+) can tour the National Synchrotron Light Source II on Thursday, June 27, 2019. Friday, June 28, 2019, 2 p.m.–4 p.m.
International Union of Crystallography (IUCr) will assist young scientists to attend IXS2019. Two awards of USD 1,050 each are available. Four poster prizes, sponsored by American Physical Society, will be awarded to participants presenting a poster at the conference. All posters are eligible and will be judged by a panel appointed by the conference committees. Preference will be given to young scientists. Prize winners will be announced at the meeting with a formal photo presentation and will be given the opportunity for a 15-min oral presentation of their poster at the conference. Mar 25, 2019 Deadline for: Submiting an abstract for an oral/poster presentation, students applying for financial assistance, and to apply for IUCr Young Scientist Awards. Apr 14, 2019 Email notification of acceptance for: Accepted oral/poster presentations, financial assistance for students, accepted applicants for IUCr Young Scientist Awards. Note: The IXS2019 conference will be held back-to-back to the REXS2019 conference.